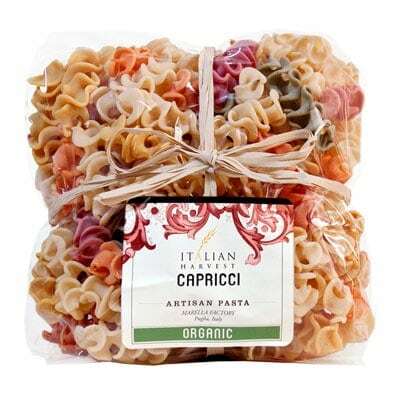 Pretty and colorful frilly pieces of pasta, this bag of Organic Capricci Mix is from pasta makers Marella. A lively pasta mix, the colors are from a variety of vegetables. Among the veggies that give this pasta its lovely festive colors are beets, tomatoes, and spinach. It can be the perfect gift for pasta enthusiasts, or as a pasta dish for your next dinner party. Marella Pasta is a recipient of the 2013 Silver Sofi Award for “Outstanding Product Line”. In addition to that, they use only 100% Italian grains and their pasta are all handmade. And they also undergo a slow and painstaking drying process, which is set at a temperature of only 37 to 38 degrees! Curious of this colorfully festive pasta? Order a bag today!